It’s hard to imagine when you look at a tree this large, but it’s almost always moving. When the wind blows, of course, it’s obvious that the tiny branches at the top are going back and forth. But there are a lot of tiny branches, and they transmit the power of the blowing wind all the way back to the main trunk. 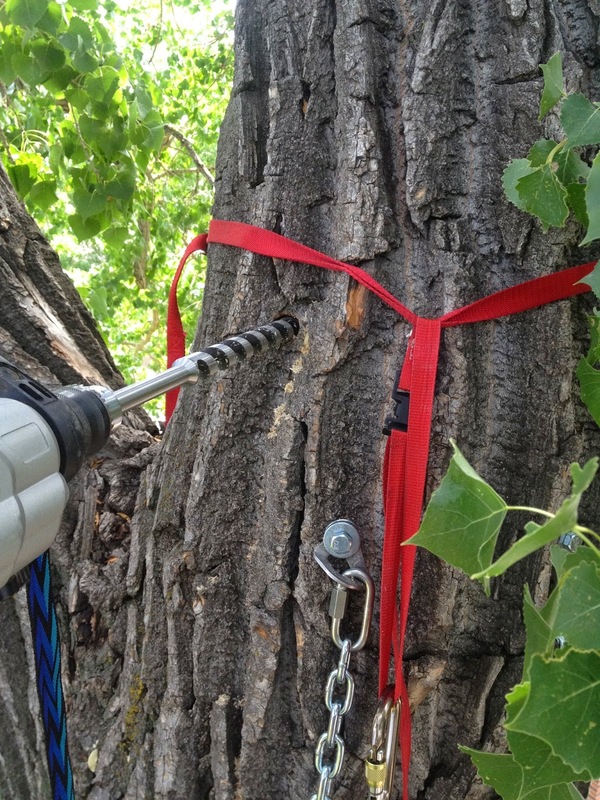 Think of a tree this size as a 100-foot lever, with the fulcrum point at the base of the trunk. Certainly the tree isn’t going to move much at all down there, it might not even be measurable. But, say, 30 feet up or so, even the giant branches -- the ones that seem like they don’t budge when I jump up and down on them -- are going to move in the wind. At the height of the biggest windstorms of the spring, those huge branches will move an inch or two as the tree sloughs off the power of the storm. It’s not a big movement. But there’s nothing that will stop it. So you’ve got to plan for your treehouse to move, at least a little. 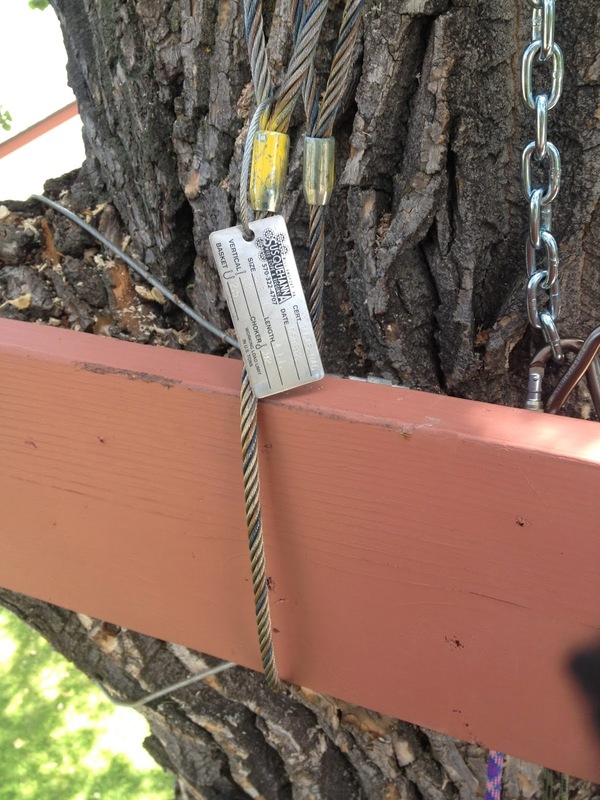 This is one of the reasons why you never want to just “pin” your treehouse beams to the tree. 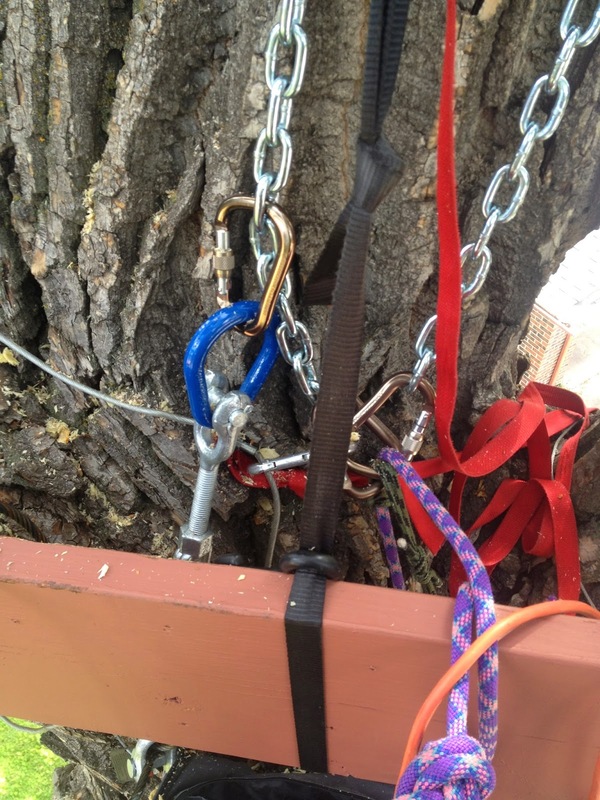 My solution was to have one end of each beam hanging off a strong steel wire attached to a big treehouse bolt; with a strong enough turnbuckle, this setup would allow me to level out the beams (and subsequently the platform and treehouse itself) even as things started to settle under their own weight. For the wire I decided (again) to overdo things. 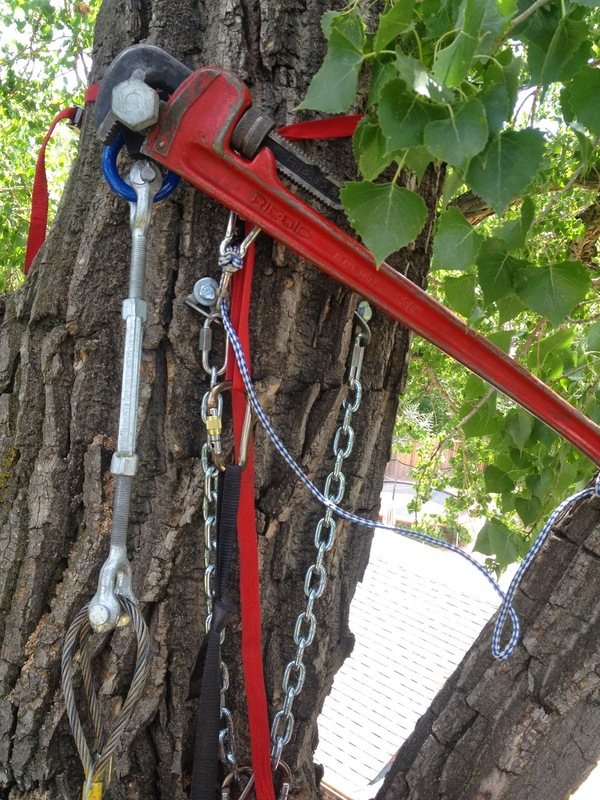 I picked up two pre-made wire rope slings about 4 feet long, which were rated with a working load limit of 2.5 tons in the basket, or U-shaped, configuration — which was how I planned to use them. Since my treehouse was going to weigh (at most) 1,000 lbs even when full of kiddos — and the wire would hold 1/4 of the weight — I liked my safety factor. I’d run the wire right under the 2x12, and bring the two loops back to a heavy-duty 3/4" x 6" jaw-and-jaw galvanized turnbuckle (working load limit: 5,200 lbs). 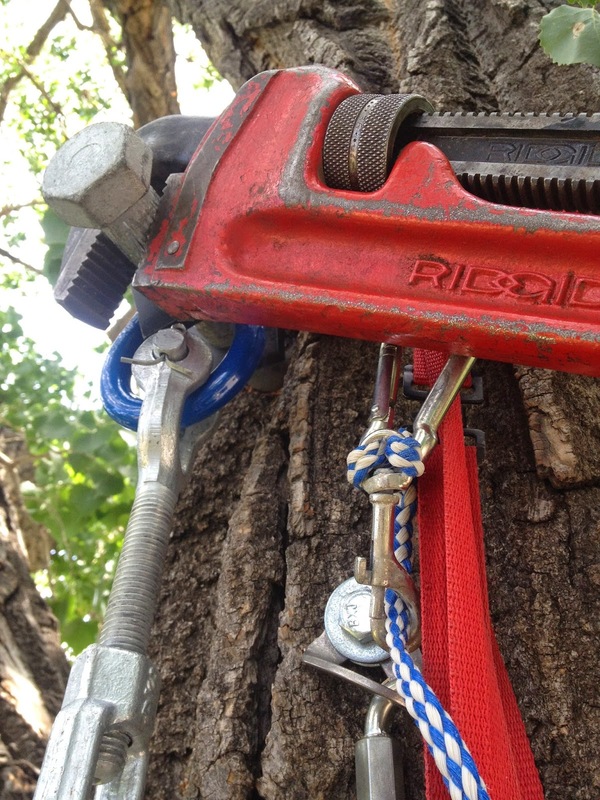 I’d planned to hook the turnbuckle right over the treehouse lag bolt, but it wouldn’t quite fit; I solved the problem with a blue pear link (working load limit: 6,000 lbs). Fortunately, drilling things at the other end was a lot easier; I was able to stand in my now-favorite little spot, right where I’d put in my permanent anchor. Safe as houses. The red strap was for hooking tools and what-not to; the chain is part of my permanent anchor. 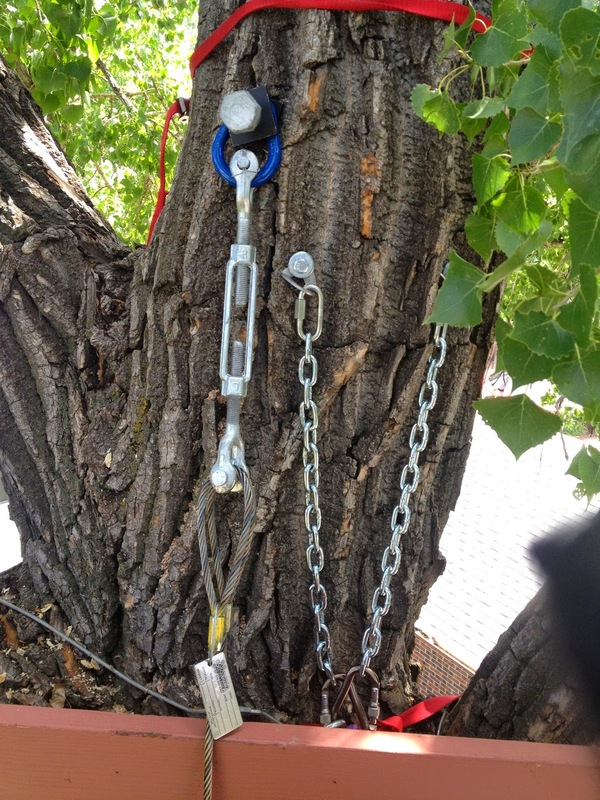 Here you can see the blue pear link and turnbuckle hanging temporarily off my anchor chain. Purple rope is my safety line, the extra small wire off to the left is a backup of sorts. Here's the whole assembly hanging off the treehouse bolt as I'm wrenching it in; for the first time you can see the wire rope sling ends, and (interestingly) both sides of my permanent anchor. The force needed to drive the treehouse bolt with the pipe wrench has scuffed up the surface. This happened with all four bolts, and was no big deal. After much, much wrenching, the finished product looked thusly. The wire rope sling just goes right under the 2x12. Once everything was in place, I leveled it off, climbed down, and took a lot of pictures. 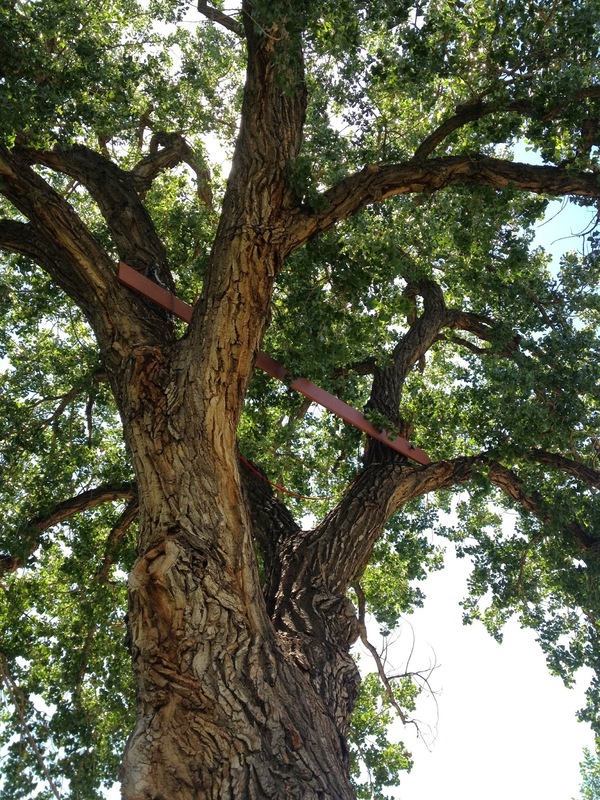 I was amazingly proud about what I’d accomplished — although objectively it amounted to nothing more than getting one piece of wood into the tree, I felt like I’d tackled the trickiest part of the whole thing. This is a great example of the perspective weirdness involved in looking up at a big tree -- it's hard to believe, but that treehouse beam is almost exactly straight and level to the ground. This effect persists today, people on the ground ask if the finished treehouse is level, too. Building a treehouse is accomplished through a series of small victories. Tomorrow, treehouse beam number two!